A contractor to the County of Los Angeles Department of Public Works is currently re-constructing this section of Altadena Drive between Santa Rosa Avenue and Lake Avenue. This work involves re-construction of the roadway and improvements to medians, curbs, gutters, and sidewalks. No construction will occur on weekends. Beginning on Friday, December 7th, and lasting through the beginning of January, all construction Monday through Friday will be finished no later than 5:00 p.m.
All driving lanes east-bound and west-bound will be open by 5:00 p.m. Temporary lane closures will occur during the day Monday through Friday. By adjusting the contractor’s schedule, Altadenans can rest assured that the construction along Altadena Drive will not impede visitors coming to see Christmas Tree Lane. Traveling to and from Christmas Tree Lane will remain accessible for the thousands of Altadenans and others who come to enjoy this annual celebration. Some of you know my passion for all things aeronautic. Thanks to my dad’s career as an airline pilot, I’ve flown in a glider, taken two intro flying lessons, risen high in a hot air balloon and covered the balloon festival in Albuquerque, covered the women’s world record skydiving record. 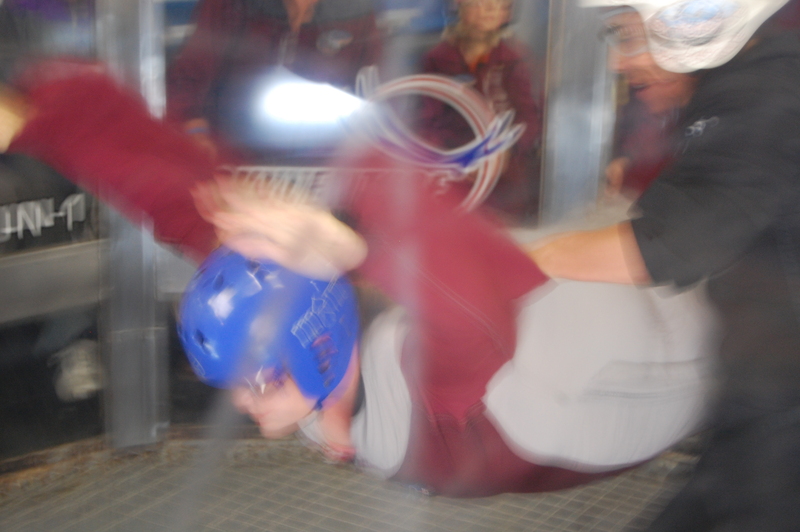 Here’s the latest: Flying in a skydiving wind tunnel! I swear, so fun. You just let yourself fall into the wind and fly! I joined three of my husband’s work associates in Orlando to leave gravity behind for a few minutes and get blasted! That’s what happens when you’ve got 120 mph wind blowing you around. I understand there’s one of these units at CityWalk now, so I say GO! GO! GO! I just hope you get a better looking ensemble to wear than I did. Crap. Sorry for big photo, my editing software took a dive, too! Thanks to Monica Hubbard for this. Wish I could be there, but will be out of town. Carry on! There will be a joint meeting of our Altadena Town Council and the PUSD School Board this coming Tuesday evening at 7 p.m. at the Altadena Community Center, 730 E. Altadena Drive. (Please note that Altadena Drive is presently closed for repaving from Lake Avenue east to Santa Rosa Avenue.) This meeting follows on the heels of a successful Nov. 13 joint meeting between the Pasadena City Council and the Pasadena School Board. A similar meeting will be held in Sierra Madre at a later time. As yet, there is no agenda for the December 4 meeting posted on the Altadena Town Council’s Web site. We are working to obtain a copy of the agenda when one is available. To see the agenda and information reports from the November 13 Joint Meeting visit http://www.cityofpasadena.net/councilagendas/2007%20agendas/Nov_13_07/agendarecap.asp . If you would like meeting notes that summarize what took place at the meeting, please e-mail me and I’ll be happy to send a copy. I hope you’ll all plan to attend the Altadena Joint Meeting on December 4 and bring with you the kinds of questions that can be addressed by these two bodies. In my mind these are “Big Picture” kinds of questions, rather than questions about individual situations that are more appropriately addressed at the school site level either with individual teachers, the school site councils, or the school site administrative leaders. What is most important, I think, is what systems and structures can be set in place by PUSD to ensure that the town of Altadena has a voice at the decision-making level in PUSD. Unlike Sierra Madre, which has its own City Council, Altadena’s Town Council is an advisory body to the L.A. County Board of Supervisors through Supervisor Antonovich’s office. However, both Altadena and Sierra Madre are part of Supervisor Antonovich’s 5th District. So I’m also interested in ways that Los Angeles County can invest in PUSD. Much as the City of Pasadena might consider handling maintenance of Pasadena school playgrounds, the County of Los Angeles could provide maintenance for the PUSD school sites located in Altadena. You will have other ideas, too. Please bring them to the meeting this Tuesday, December 4. We all need to be advocates for the schools in our town and the children and families they serve. P.S. Your name may be on more than one community list. Apologies if you receive duplicate messages. Here’s an update to this post. It’s now Christmas. I’m making more coffee bread. I realize this recipe leaves a little out. The ingredients should be divided. The last two are for the topping. To clarify how to place the ingredients in your bread machine, this is what mine likes: Mix all your wet ingredients and pour them in first. Then pour in all your already mixed dry ingredients, EXCEPT THE YEAST. Create a little well at the top of your flour mixture heap and pour the yeast on top like a snow covered volcano. Then let the machine do its thing. One more thing: I add a touch of vanilla to the dough as a personal preference. A touch of almond extract is also very nice. I actually had time to visit with people this holiday. What a treat. We also had our Thanksgiving dinner on Saturday with just a couple of friends we haven’t seen in a while, plus one of our favorites — Lizzie. That gave me time to bake a few things ahead on Thanksgiving day, when it was cool and quiet. In fact, because I couldn’t find my recipe box, I searched online for a couple of my favorites and really scored. My Swedish grandma always made cardamom bread and I love to make it when I have time. It’s warm, braided, cinnamon sugar topped love. But it takes forever to make the dough, knead it, let it rise, knead it again, then braid it, and let it rise again. Online I found a version that uses a bread machine — brilliant! And it was PERFECT. Grandma would’ve been so pleased — she loved shortcuts that work (she’d have used Minute Rice in her rice pudding if it worked). So here’s the recipe I am thankful for. Give it a try and follow the tip at the end. I did the same thing to keep the temperature warm and constant. I would also suggest warm milk to help the yeast rise. Good luck! Thank you so much for a smaller (1 loaf instead of 3) and quick version of my great-great-aunt’s “Vetebrod” (umlout omitted, as I don’t know how to type it )! To keep the temperature consistant for the dough to rise, I’ve found that if you turn on the oven to 400 degrees for 1 minute, then turn it off and put the bread in immediately (covered with a clean, lint free cloth) and allow it to sit for 1 hour. It keeps the temp more consistant in my draftly kitchen. 🙂 I think the crust was a little tougher than normal this way (but still good) and I had to add a little flour during the knead cycle to keep it from sticking to the sides of the bread machine. If you can’t find pearl sugar, regular granulated works well. A quick heads up for anyone who has not purchased Cardamom before – it’s expensive and can be difficult to find. Only one local store here (it’s a small town) carries it ground (Spice Islands) at $11.99 for a jar. Keep in mind that ground loses it’s potency once opened, so keep the jar TIGHTLY closed for it’s next use. Thanks again for the recipe!! I doubt many of you are blogging today, but we’re doing our Thanksgiving a little differently this year. It’s been such a busy time the past few months with my work deadlines, and my husband considering a job change for several months and then making it this past week! I also had a writing conference in St. Louis and then met up with Steve in Orlando for IAAPA, the major theme park convention of the year. It was a huge success for his new company so he’s now engineering some fabulous new rides that you’ll see in parks in a couple of years. So while in Orlando we had to do “research.” That meant Kennedy Space Center’s new shuttle launch ride, Universal, Disney World and Epcot in three days. My head is still spinning. Didn’t care much for Disney World, but I love the expanse and etherial quality of Epcot. We had a luscious dinner upstairs at the Bistro in the French Pavilion. So with all that, there wasn’t much time for Thanksgiving preparation. And I came home with a sinus/cold thing, so I could barely get through the grocery store. So we’re taking it easy today, gearing up for a small gathering on Saturday instead. It’ll take that long to get the house together since we’ve also been remodeling a bit even with everything else going on. So I’m thankful this year for the time to relax, to walk our dog Fozzy up Cheney Trail, the time to make some dishes in advance (Grandma’s rice pudding, pumpkin cheesecake and Swedish coffee bread), Steve’s amazing cooking talents, his new job, our sanity the love of friends and family. I want to send special thoughts and blessings to friend Susan who’s at City of Hope this holiday, to my mother-in-law who had her own health issue recently, and to yoga friend Helen, who was recently diagnosed with breast cancer. Cheers to all! Thank you for being a valued member of the United Nations Association family. It is through your interest, commitment and effort that we are moving forward in our mission to create A Better World Now. With your help, we continue to build on the rich foundation laid by the Pasadena-Foothills Chapter over the last 60 years. For much of that time, the former UNA store on Green Street here in Pasadena, was for many, the heart and soul of the UNA. While the store closed many years ago, many may still remember the store fondly as a place to buy unique gifts, UNICEF cards for the holidays and to learn more about current issues affecting the global community. In this fine tradition, we are pleased to share that we will be opening a new UN Store-online! Our first product featured is The Millennium Development Goals T-shirt, a limited edition designed by Cindy Bennett. Made with 100% sustainable materials we hope that you will visit our website and buy one, give one to a friend and help to change the world! 2007 has been a banner year for the expansion of United Nations Association Pasadena Foothills Chapter, its programs and advocacy. We have begun to use the phrase “UN Renaissance” to describe the new level of participation in Chapter campaigns and events. This year, the UN welcomed Secretary General Ban Ki Moon who quickly moved environmental sustainability to the forefront of the UN’s global agenda. Here in Pasadena, we did the same. Many of you attended our environmental awareness event-Going Green in June, where we honored Mayor Bill Bogaard and the City of Pasadena for creating the Green City Action Plan based on the UN Environmental Accords. Last month, our UN Day featured a keynote address by Gillian Sorensen, Senior Advisor for the UN Foundation and former Under Secretary General of the United Nations. Her message underscored that while the UN is in need of reform, it is still our most valuable ally in the fight to stop the spread of HIV/AIDS, to help the economic stability of third world countries, peacekeeping and eradicating world hunger! Locally, UN Clubs are now thriving at several area schools including McKinley Elementary school, Mayfield Senior School and Pasadena City College. This year also marks the beginning of a new UNA collaboration with Pasadena Unified School District in an effort to expand the Model United Nations in area public schools. The Model UN is a highly successful national program that is an interactive, interdisciplinary simulation which places students in the role of official United Nation delegates. Student participants gain life skills including communication, critical thinking, negotiation and conflict resolution problem solving. We continue to engage the US public with global issues through our Advocacy and Human Rights work. Many of us participated in Congressman Adam Schiff’s Darfur Forum and thanks to our Advocacy Committee, our website now provides a conduit to reach elected officials, in-a-click, allowing us all to weigh-in on legislation affecting international concerns. Communication is the key to our UNA community’s growth and participation. We hope that you have been enjoying the monthly newsletter that announces events, UN news locally and globally and other subjects impacting the UN Millennium Development Goals. We encourage you to join a committee, write an article for the newsletter, volunteer at our headquarters, come to an event and bring a friend! There are many opportunities for involvement, including our monthly Coffee Talks speaker’s series, a social evening that brings the community together to hear expert speakers on the subjects you care most about. We offer thanks to all those who have collaborated to support our work this year including UNA members, our Board of Directors, local schools and colleges, other non profits, local businesses, churches and synagogues and The City of Pasadena. None of this is possible without your ongoing support. We thank you in advance for your donation to the UNA. Donations can be made online by at unapasadena.org or by check, payable to UNA Pasadena. Check donations may be mailed to our offices at 75 South Grand Avenue, Pasadena CA 91105. While challenges facing the UN and the world are enormous, one thing is clear; we are living in an interdependent world that is increasingly reliant on the global and local community for cooperation. We thank you for all that you do! United Nations Association Pasadena/Foothills Chapter, Inc.